Raw Horsepower was originally started to develop a website to help people (including ourselves) find websites for our interests in "performance toys". There are some great information websites available, but they only cover one interest or category. Since many of us have several interests, we have created links to the great information websites, along with some of our favorites, friends and partners. We are working hard to become the ultimate online power source to find any part or accessory for any performance, custom and classic motor-powered creation you own. We wanted to provide quality embroidered apparel which we could never seem to find. We were looking for apparel with good colors and designs which catered to our interests in cars, hot rods, trucks, bikes, racing and performance related sports. The goal is to provide quality designs with good detail and color at attractive prices. We have received excellent feedback from our customers about our products and we are working on designs to cover their interests. We look forward to providing you with quick, easy to read formats to get you the information you need without pop-up windows. We intend to keep our categories completely separated for ease of use. Please feel free to contact us with your feedback, we are trying to make this the easiest for all of us to enjoy. What better people to give the first hoodies available to other than Sammy Hagar, Michael Anthony, Joe Satriani and Kenny Aronoff of Chickenfoot. 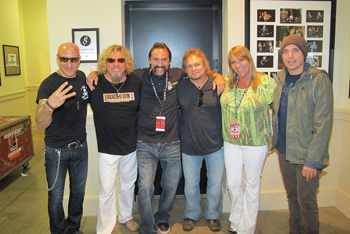 What a pleasure to meet my long time favorite singer Sammy Hagar from his start with Montrose and early solo career whos music as always graced my vehicles. I was excited Sammy pointed out the skull logo on my shirt to Mike as they had hoodies delivered to their dressing room earlier. Mad Mike Anthony one of the best bassists and definite hot rod guy. Mike was the one who put the fun in Van Halen with his Jack Daniels and wild antics he would always entertain. Mike's drink developed into his signature bass with two pockets hiding miniatures of them. Mike has showed his love of cars and I would love to see his car collection and gather some pictures to share here. Joe Satriani is the quiet one of the bunch but an extremely talented guitarist. I have been listening to Joe since "Surfing with the Alien" came out and follow along his career even catching him in the Hendrix Experience tour. Joe is what I believe to be about the best guitarist out there, very refined and developed music style, he adds speed and creativity for a complete package. Kenny was very polite and fun and great drummer that night! As many Chickenfoot fans wonder who was this new drummer filling in for Chad Smith. (Chad Smith is currently touring with his regular band, Red Hot Chili Peppers, and looks amazingly like Will Ferrell). Kenny was playing the drums with skill and fierce energy and great to watch. Looking up his bio and all the artists he has played with I realized I've seen him play before. Thanks Chickenfoot for putting on a great show and getting back to your roots. Hope you like the hoodies guys. Lead photographer, editor and designer for website and social media. Many years with all facets of the motor world from cars, truck, boats and motorcycles. Background work includes automotive and motorcycle builds, involvement with automotive groups, some road course and supercomp dragster racing experience to complete a wide knowledge of the motorized world. New to our staff this year, Robert has years of automotive fabrication skills providing us with great technical background for automotive tools, fabrication techniques and paint products to provide better content for our readers. He will provide photography work to increase our presence at events and shows. Assists us in the office and while attending events. She can handle the camera as well as provide writing assistance at media events. Avid car show advocate and photographer helping us handle multiple events. He has provided great starting line photos from drag racing events.